Poly Bagging Services - Steve's Bindery Service, Inc.
Polyethylene bags are used to protect printed materials during shipment from moisture, dirt and dust. It is the safest way to get your product to an end user without damage to the materials. How you package your product is often as important as what is inside. We can help you attractively showcase your materials. Clear poly bags are an excellent way to package your product in an affordable, convenient and visually effective way. Our poly bags are formed off a roll of polyethylene as your material cycles through our polywrapper machine. We use 125 ml clear United States Postal Service approved poly, which allows for economical mailing at competitive prices. Poly bagging also allows for a postal automation discount on flat size mail pieces, saving you even more. 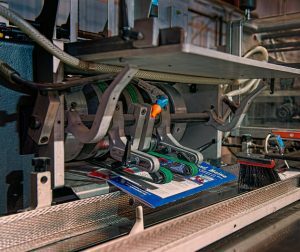 No run is too small or too large for Steve’s Bindery Service, Inc. We can provide poly bagging for manual and automated collating. We offer up to a maximum of four onserts such as flyers, supplemental catalogs, samples and advertisements. We also offer mailing list data conversion and can sort and bag or skid pack for the mail. Our poly bagging machine, the CMC Ritmica Model SH-30 High Speed Polywrapper, can handle virtually any polywrapping task you need. It has a maximum cycling speed of 10,000 pieces per hour, but because we have found that operating our equipment at slower speeds produces a higher quality product with less downtime because of machine malfunction, we run it at 5,000 pieces per hour. We can wrap media with trim sizes of 4” x 6” minimum, 11” x 14” maximum and up to 1 1/8” thick. It’s ideal for mailing applications. This piece of equipment was custom built in Città di Costello, Italy, for Steve’s Bindery Service, Inc., and Steve flew to Italy to approve it and receive personal training on how to operate the Ritmica SH-30. Our equipment is meticulously maintained, thereby minimizing downtime that could affect your schedule.